Some of my earliest and best Christmas memories are integrally tied to the music I was listening to. My Mum and Dad had an album of Christmas songs, and it used to go on the record player in December as my brother and I clamoured to hear our favourite songs. Later on, when I was teenager performing in our local pantomime, I loved the music they played before the show started. It got us into the party mood with old hits like, "I Wish It Could Be Christmas Every Day", or "Mary's Boy Child". 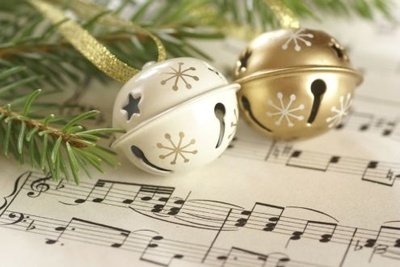 For me, Christmas has always been about music, whether traditional or popular, in the church or the home. I don't think you can compare the two though, so I'm splitting my top ten. First up, my personal top ten traditional Christmas songs. Although, to be honest, I reckon I could have got about 30 on this list. I love Christmas songs. What have five gold rings got to do with Christmas? Who knows. But I love the way the song changes at that point. Even if you don't know any of the rest of the words, is it ladies leaping, or lords dancing, and how many of them are doing anything anyway, then you will still be able to join in at 5 GO---OOLD RINGS! One of the first carols I learned. I always found it very soothing. It's a nursery bed-time song as much as it is a Christmas carol. It's quite a sweet children's song for Christmas, and is still a favourite at nursery nativity plays. I love this one because of the misunderstanding associated with it. I'm sure I can't be the only child who thought that they were the Kings of a fantastical place called Orientar. Am I? Please say I am not. This makes my list because it's the first carol I learned in Latin as well as in English. I love singing it in Latin, it makes me feel like I am singing in the Middle Ages! How many times have I sung this song? Thousands I would guess, and a large proportion of those singings were at Christmas parties waiting for a stand-in Santa to appear (the real Santa being too busy making gifts at the North Pole to attend, of course). It's also quite good in French, but has completely different words about the winter wind. I got a bit bored of it over the years, but learning the French version a few years ago gave it a new lease of life for me! I like this one because it anthropomorphises Bethlehem in such a cute way. Whenever I sing it, I always imagine Bethlehem like one of those Christmas cards you'd make at school: with a silhouetted village against a orange backdrop. It also has a lovely sentiment and a sweet tune. 8. Ding Dong Merrily on High! When we were getting ready for panto we used to make that Gloria go on and on and on and on until we couldn't stop for laughing. The others sharing our dressing room didn't find it quite so funny. This is one of the few Christmas songs in a minor key, and it gives it a unique sound. There's something about it that feels so traditionally Dickensian (fact: Charles Dickens was born during an unusually cold period of English weather - in 1814, when he was 2, the very last Frost Fair was held on the River Thames) and I just love it. It's a much less common carol to hear. The first Christmas song that I remember learning on the recorder, and thus it makes my list! Which ones would you have on your list?